Looking to satisfy that sweets craving? Below we’ll list 10 candy shops in Connecticut you should visit. Before you read the list we want to clarify, yes, some of these shops sell more than just candy, but that doesn’t change how great they are to visit! Located in Wallingford, Mr. D’s offers dozens of candy options along with cupcakes and ice cream and other fun surprises. At Gumdrops and Lollipops in Niantic you can choose from a large array of different types of candy! From nostalgic old fashioned candies to sea salt taffy and much more they have something to please everyone. Dylan's Candy Bar houses over 7,000 confections, boasting the largest selection of candies and candy-related gifts from around the world. Visit their location at Mohegan Sun in Uncasville. Fuzziwig’s Candy Factory located in Clinton carries over 300 types of bulk candy ranging from gummy worms, gummy bears, peach rings and cola bottles, to killer gummy sharks, and gummy fried eggs. You can also find dozens of novelty and nostalgic candy, including Wax Lips, Candy Buttons, Abba-Zaba, Pez, Mallo Cups and hundreds more as well as plush toys from TY, Hello Kitty, and more. Located in Mystic, Mystic Sweet’s selection goes beyond the light and dark of chocolate but covers every color in between. They also offer gummies, jelly beans, and penny candies sold by the pound. On top of that they also carry some of the highest quality local brands. CandiTopia, located in New Haven, is a premium quality candy store, specializing in nostalgic, hard-to-find candy. CandiTopia embraces New Haven’s sweets history as the birthplace of the “Lolly Pop,” which was first made by the Bradley-Smith Candy Company in 1892. Nestled along the Connecticut River in Haddam, Goodspeed’s Station offers an array of unique and nostalgic candy, specialty foods, gifts, and more. 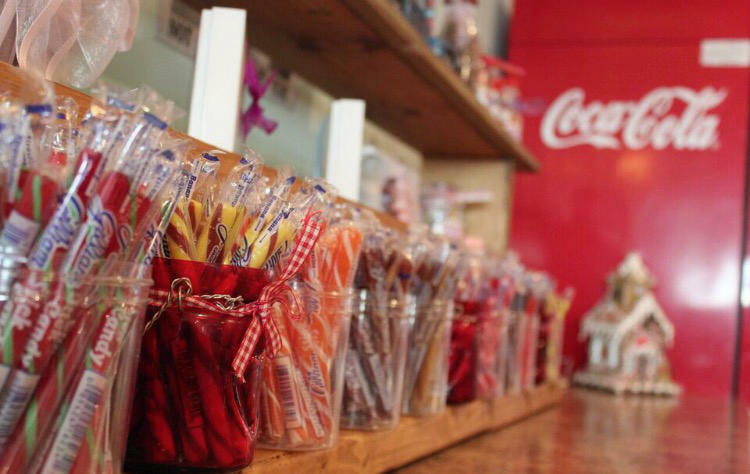 Deborah Ann's Sweet Shoppe, located in the heart of downtown Ridgefield, is a chocolate and candy fantasy store featuring homemade and imported chocolates, bulk candy, homemade ice cream, novelties and a variety of gifts suitable to make any age happy. Located in Old Lyme, The Chocolate Shell offers chocolate delights such as Truffles, Turtles, and Bonbons as well as other candies including Abba Zabba, Air Heads, Bubble Tape, Double Bubba, Candy Necklaces, Ice Cubes, Peanut Chews, Soda Bottles, Swedish Fish and more. Located in Wethersfield, Old Wethersfield Country Store offers a wide variety of different candies and sweets. They also offer unique gifts, specialty foods, and more. None of the photos used in this article are property of Local Connecticut. Please reference names below each photo in regards to the owner.